This is currently one of the oldest items in the Collection. 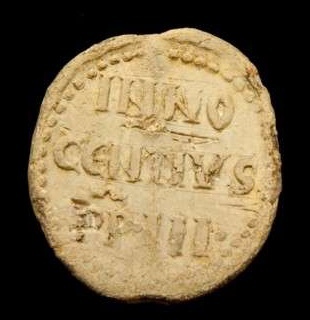 It is the actual lead seal, the bulla from a document known as a papal bull. 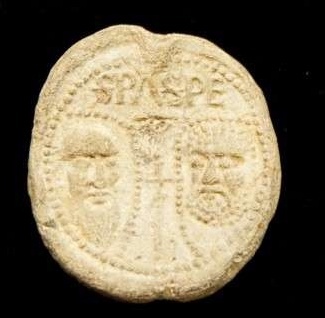 The bulla acts as the signature of the pope. Historically, he is the most politically powerful pope that ever lived, making this an especially fine item to have in this Collection. 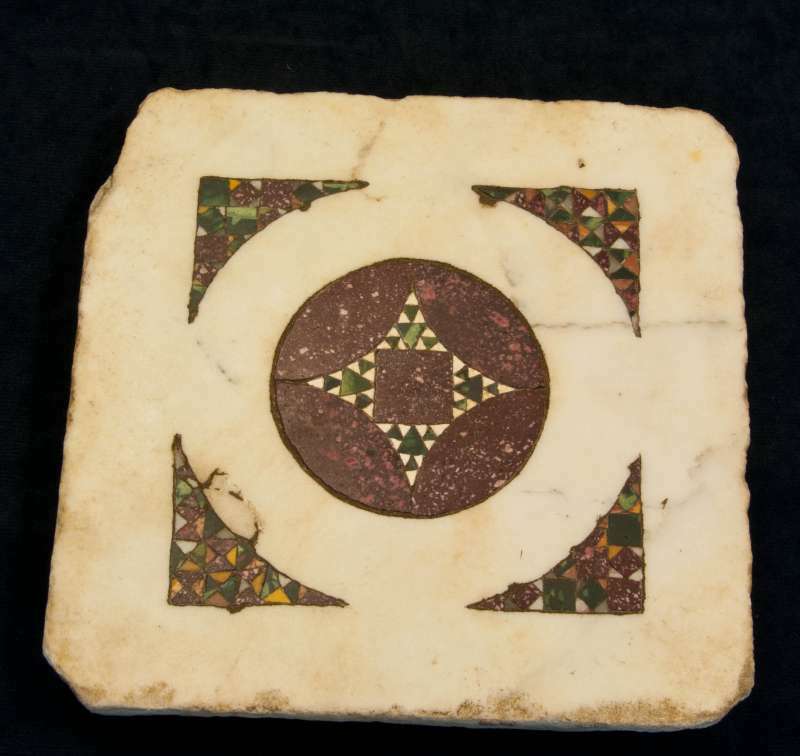 This is a very rare artifact, an 8″ X 8″ tile created by the Cosmati family, who have been in existence for centuries and have created exquisite patterned flooring all over Italy as well as England. Cosmati floors, also called Cosmatesco or Cosmatesque, are a particular form of what archeologists, architects and art historians call opus sectile (cut work) where pieces of stone are cut to whatever size and shape is required to create geometric patterns when fitted together. Roman and Byzantine mosaics, termed opus tessellatum, are pictures and designs created from small, more or less uniform size pieces of colored stone and glass called tesserae. The progression from mosaic to Cosmatesque reflects both technical discoveries and evolved tastes in decoration. The characteristics of Cosmati work include complex assemblies of simple shapes like triangles and squares in repetitive designs, often featuring red and green stone. Interweaving, sinuous ribbons (known as guilloché) were another design. Why are they called Cosmati? Why did Cosmati work develop in Rome? In medieval times when the Cosmati were at work, their marble and other stone came from the ruined temples and buildings of ancient Rome. The extraordinary disks that mark their work come from salvaged columns carefully sliced. Buried statues, fallen slabs and inscription panels were dug up and turned into millions of pattern pieces and frames. Aside from creamy whites, the primary stones used were both green and reddish purple porphyry, though yellow giallo antico and many other colored marbles show up as well. The designs and patterns used are very similar to those found in Constantinople and other Byzantine sites. It is thought that Eastern mosaic craftsmen brought in to decorate the Monastery of Monte Cassino south of Rome in the late 11th century may have inspired the style that became known as Cosmati work. So perhaps it’s no coincidence that Magister Paulus had his workshop nearby in Ferentino.